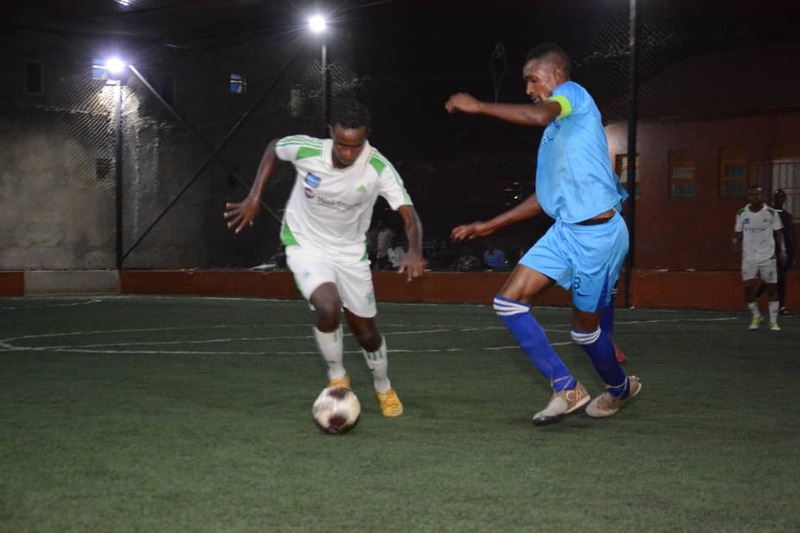 MENGO – Yeak Kabowa are surely closing in on a first ever Futsal Super League title. The Kabowa based side who were nowhere near the favourites at the start of the season are brushing aside everyone that stands in their way. On Thursday, they were at it again, whalloping Mengo City 7-2. In a one sided affair, Yeak were already 3-1 up by halftime and dominating proceedings in terms of possession and shots on-goal and target. In the second, they added four more and conceded one to win the contest comfortably. Enock Ssebagala scored four and the trio of Emma Magembe, Andrew Katende and Shaffic Avemah helped themselves to one each. For Mengo, it was Najib Muwonge and Ronald Nsamba (og) who scored for them. The win takes Yeak to 32 points from 13 games, five ahead of second placed Park. For Mengo, they remain 9th after gathering 16 points. In the opening fixture of the evening, Equator came from a goal down to defeat Aidenal. Aidenal held a slender 1-0 lead at halftime thanks to Fred Kajooga’s goal. They however spent most of the second half pegged in their own half, eventually conceding two goals and losing the game. Equator’s goals were scored by Ismail Adan and Sulaiman Mutyaba to ensure their 4th win of the season. The three points earned see Equator climb into 10th on the standings with 14 points while Aidenal slip into 11th with 12 points. Elsewhere, Bajim powered their way onto a 3-2 win over crown. Ibrahim Kamya put Bajim ahead at the stroke of halftime with a well taken penalty after Crown had accumulated six fouls. It was soon 2-0 at the start of the second with substitute Franco Sunday scoring his 7th of the campaign. Crown pulled one back through Ahmed Ali but their joy was short lived as Kamya scored his second of the night off a swift counter attacking move. Despite Crown scoring again a minute to full time through Ahmed Mohamud, Bajim held on to a 5th victory of the season which takes them into 8th with 19 points. For Crown who led the standings at some stage, they are now 6th with 22 points. In the game involving defending champions Dream and Nomad, Swaib Kazibwe struck twice as last year’s winners won the game 4-1 on the night. It was a tense first period with Dream going into the break leading but 2-1 but they would later gain control of the game to score two more goals in the second. Jamal Muyingo and Peter Kikomeko scored the other two goals for Dream while Jama Osman grabbed Nomad’s consolation. In the other results, Kabowa United defeated Yap Stars 1-0, Park were 6-5 winners over Elephants while Typhoon humiliated Parakeets 6-2. Yeak’s Shaffic Avemah still leads the standings with 25 goals, four ahead of teammate Enock Sebagala. There will not be League action next week with the Uganda Cup Round of 8 taking center stage at the same venue.